While surprising customers is the goal of a haunted house or trail, it's also important to make sure you aren't surprised! One of the best ways to do that is by having crystal clear communication with two way radio walkie talkies. Knowing exactly when a patron is turning the corner or entering a certain part of the maze and monitoring the number of patrons can be difficult tasks, but are made simple with the help of two way radios. Using discrete communication with earpieces and other audio accessories allows for great opportunity to scare your customers as effectively as possible! Not only do two way radios improve communication, they also assist with safety - both for your patrons and for your employees! Haunted houses, mazes, and trails are dark and crowded places, often having objects and people popping out in surprise. All of these things can contribute to an accident or injury. It's important to have quick reaction time and the ability to resolve emergencies quickly and two way radios give you the ability to do just that. Haunted houses and trails can vary in size and environment so it is important to choose the correct two way radio for your specific needs. 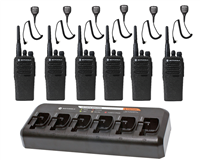 For smaller haunted houses, you will want to take a look at the Motorola CLS1110 or Motorola CLS1410. These walkie talkies will cover up to 200,000 square feet in most circumstances and are compact and lightweight. These would be great walkie talkies for smaller, more subdued haunted environments that are mostly indoors. The Motorola CLP1010 is very similar to the CLS1110 and CLS1410 and is ideal for similar situations. The CLP1010 is actually smaller and more lightweight than the CLS radios. This is mostly because there is no external speaker - the CLP1010 must be used with an earpiece, but an earpiece is included with the radio for you to use. For a slightly bigger haunted house or trail, the Motorola RMU2040 will communicate up to 250,000 square feet and is great for both indoor and outdoor rugged environments. The RMU2040 has outstanding audio quality and can withstand drops outside. For even larger haunted trails or houses, the Motorola RDU4100 and Motorola RDV5100 are as powerful as any radio you will find. The RDU4100 is perfect for environments that need to communicate both indoors and outdoors while the RDV5100 is better for strictly outdoor use such as corn mazes or tractor rides.